We purchase our calves as soon as they are weaned from their mothers and then we raise them for the next 12 - 18 months. They are fed unlimited amounts of hay and clover along with our own organic grain including: oats, corn and triticale; Redmond natural salt and minerals to meet their nutrient requirements. Our cattle are never locked in a barn, instead they have their own outdoor yards that allow them plenty of space. Our pigs are purchased as babies from a local farm, and then raised on our farm until they reach approximately 240-260 lbs. live weight. 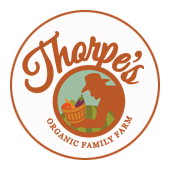 They are fed a 100% organic diet comprised of our own grains, as well as certified organic fruits and vegetables from our farm. Beef is available year round, both by the lb. already cut and packaged, as well as by the quarter or side. Our farm store is always well stocked with frozen, individual cuts. We offer a wide array of ground beef, steaks, roasts, and soup bones. We often have heart, liver, tongue etc., call us for availability. If you choose to order either a quarter or side of a steer, we will walk you through the options of specific cuts of meat. *For a more detailed price list, click here. Pork is generally available year round, both by the lb. already cut and packaged, as well as by the side. Our farm store is well stocked with many different cuts of pork. Typically, we offer smoked hams, ham steaks, pork chops, pork roasts, bacon, pig feet, and ground pork. Sides of pork are priced at $3.60 per lb. (hanging weight), plus the cost of smoking. The smoking cost varies according to how much you would like smoked, but the average cost is $30. We pay for the cutting and processing.